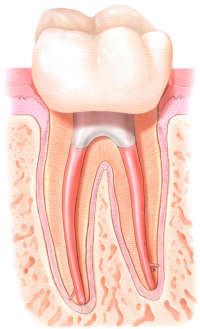 The goal of a root canal treatment is to save a diseased tooth. Endodontic treatment is necessary when the pulp, or center, of the tooth becomes infected or inflamed in response to deep decay or cracks in the tooth. If pulp infection is left untreated, it can cause pain or lead to an abscess. Signs of pulp damage include prolonged sensitivity to hot or cold, pain upon biting, discoloration of the tooth, and swelling of the nearby gums. Sometimes, however, there are no symptoms and a diagnosis can only be determined via radiographic exam. An endodontist is a dentist who specializes in root canals and who went through additional schooling and training to become an expert in saving teeth. Dr. Zoufan has been in dentistry for over a decade. He prides himself in using the most state-of-the-art technology including digital imaging, microscopes, and ultrasonic instrumentation. 1. The tooth and surrounding area will be numbed, and then isolated with a “dental dam”. This dam keeps the tooth clean and free of saliva (i.e. further infection) during the procedure. 2. The endodontist makes a small opening in the crown of the tooth to remove any decay and access the pulp where infection is building up. 3. Through the use of very small instruments and various antimicrobial agents, the infected pulp is removed and the pulp chambers are cleaned both physically and microbially. 4. 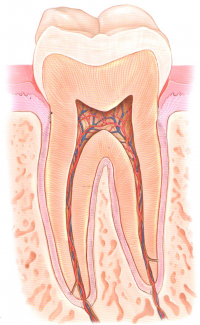 If the tooth is badly infected, the endodontist may place antibiotic paste in the canals and schedule a second visit for the completion of treatment once the inflammation has calmed. 5. After the canals are thoroughly cleaned, the endodontist will shape them to prepare them for the root filling called gutta percha. Gutta percha is a flexible, biocompatible material perfect for this purpose. 6. 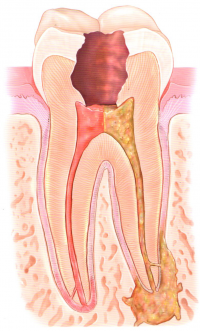 Once the canal is filled, the tooth may be sealed either temporarily with sponge and temporary filling or permanently with core filling material and a crown. Sometimes, a post may also be placed inside the tooth for added structural stability. These will protect and restore the tooth to full function.